You'll be £12.99 closer to your next £10.00 credit when you purchase Tanks of the USSR 1917-1945. What's this? The book includes a comprehensive table of contents which makes it easy to locate any vehicle. There is no index but the table of contents really negates the need for one. Highly Recommended for those who need a quick ‘one stop’ basic reference for Soviet Tanks of WW2. In reading this book I was struck by the astronomical growth of the Soviet tank forces in a period of less than 30 years — but really over a period of only 15 years. If you are unfamiliar with Russian armor of this period, or simply want to get a useful insight into its development, you will find this book exceedingly useful. As an entry level reference work the book is clear, concise and features all of the major types immediately recognisable to most, but it also includes details of less well known vehicles, especially those in the early part of the 20th Century and pre-WWII. vehicles but by the start of World War 2 they were producing their own designs. there is a lack of data or they were beyond the scope of the book. etc. These details are sufficient to answer most queries on the type. A useful guide not only to the main battle tanks but also to the rarer examples of Soviet weapons development. 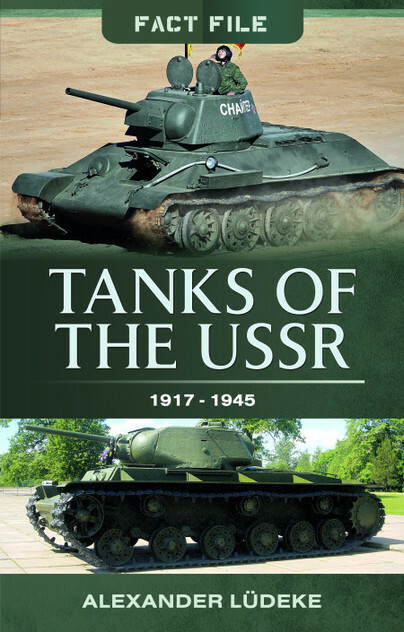 This very affordable book provide a wealth of information on full period from the October Revolution to the end of World War II for the Red Army armoured capability. The photographs are very interesting an include some that have suffered from the conditions at the time they were shot and subsequent storage, but provide important imagery. Highly Recommended. This fact file is quite amazing for the amount of detail it manages to cram into its pages. The history and development of Russian tanks from the end of WW1 to the end of WW2 is covered in depth, with information in some cases, that I have previously not heard of, despite my many years of reading such things. I particularly enjoyed the sections on early tanks that took part in WW2....even if not originally expected to. It is a quite informative and readable account that shoots down a few myths and concentrates instead of the real details. It does not cover self propelled artillery, which I presume will be another volume. Certainly if they had, this one would have been rather too large, so I can understand why they did not. I would recommend this book to most readers, but in particular it would be a handy book to have in your bag if you are a war gamer that attends club games and has 'that person' who always claims to know more than everyone else. A quick look at the pages can shoot that person down with ease. Oh and one thing I was surprised about. The KV series of tanks were actually the KW series. The inventor named it after the first two initials of his father in law's name. KW.